What can you do with your now Banned Mythic Rare M:TG Card? What can you do with your Mythic Rare Magic: the Gathering card that was just banned from tournament play? 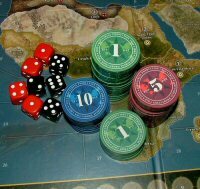 White Wizard Games recommends you send them that no longer valid card to them in exchange for a free copy of Epic Card Game. When Wizards of the Coast announced a new list of banned and restricted cards from Standard play on January 9th, Rob Dougherty and Darwin Kastle of White Wizard Games — both Magic the Gathering Pro Tour Champions and inductees into the Magic Pro Tour Hall of Fame — decided to offer an exchange deal for two of the rare cards banned from play. 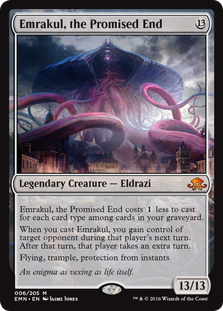 Emrakul, the Promised End, a mythic rare card which sold for around $20 was banned for being too “scarily powerful”, facing little resistance and ending games too quickly. “She was the world-ending, all-powerful monster she was in the story, which was too much for Standard,” reads the announcement from Wizards of the Coast. Smuggler’s Copter, a rare card that sold for about $10, was banned because it “shows up in too many decks, diminishing the format’s diversity,” according to WotC. Brazilian players who purchased a copy of any of the banned cards between December 10th and January 9th at Bazar de Bagdá, one of Brazil’s largest MtG game stores, may return those cards to the store and be refunded in store credit. Willy Edel, owner of Bazar de Bagdá, is also a Pro Tour Player and in the Magic the Gathering Hall of Fame.